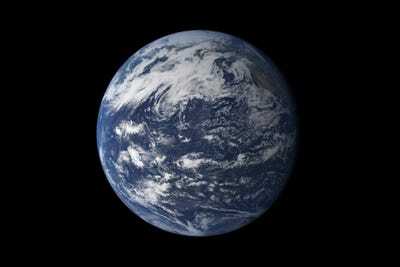 NASAThe majority of Earth’s surface is covered by either liquid or frozen water. Maybe you have heard people call Earth “the water planet.” The nickname is well-deserved. As this mosaic of images from the Moderate Resolution Imaging Spectroradiometer (MODIS) on the Terra satellite conveys so well, the majority of Earth’s surface is covered by either liquid or frozen water. The atmosphere is awash with water as well. One satellite-based data set estimates that about 60 per cent of Earth’s surface is covered by clouds (composed of water and ice droplets) at any given time. Earth is home to yet another type of water — groundwater — which includes all the fresh water stored underground in soil and porous rock aquifers. Though groundwater is often forgotten because it’s not visible, more than two billion people rely on it as their primary water source. 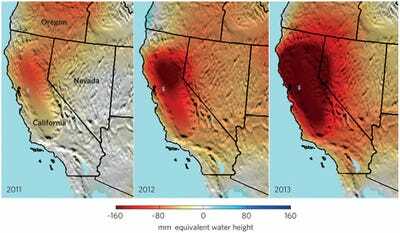 With drought afflicting several parts of the world, and with aggressive use of groundwater in many agricultural regions, this precious water resource is under serious strain, warns NASA Jet Propulsion Laboratory hydrologist James Famiglietti. In many parts of the world, in particular in the dry, mid-latitudes, far more water is used than is available on an annual, renewable basis. Precipitation, snowmelt, and streamflow are no longer enough to supply the multiple, competing demands for society’s water needs. Because the gap between supply and demand is routinely bridged with non-renewable groundwater, even more so during drought, groundwater supplies in some major aquifers will be depleted in a matter of decades. The myth of limitless water and the free-for-all mentality that has pervaded groundwater use must now come to an end. Most of the major aquifers in the world’s arid and semi-arid zones — the parts of the world that rely most heavily on groundwater — are experiencing rapid rates of depletion because of water use by farms. 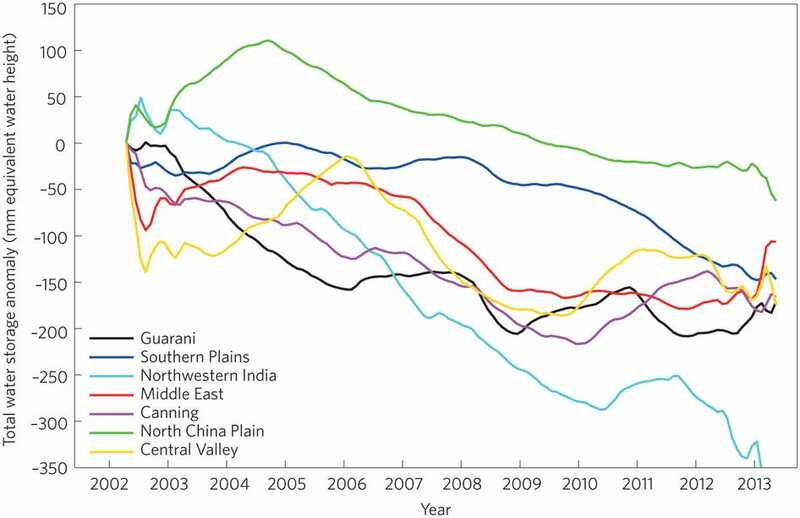 As shown in the chart above — based on data collected by the Gravity Recovery and Climate Experiment (GRACE) — this includes include the North China Plain, Australia’s Canning Basin, the Northwest Sahara Aquifer System, the Guarani Aquifer in South America, the High Plains and Central Valley aquifers of the United States, and the aquifers beneath northwestern India and the Middle East. The situation is looking particularly grim in California, a state currently suffering from extreme drought. The extent of the drought is visible in the series of GRACE maps of dry season (September-November) water storage anomalies shown below. 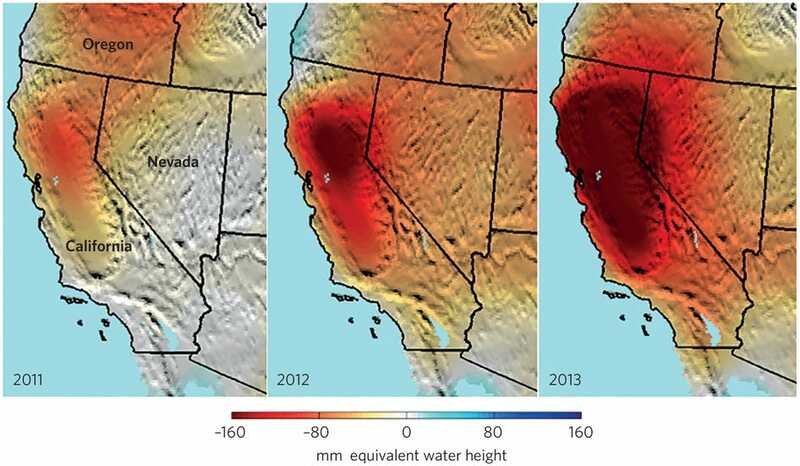 Red areas show the height of the water in comparison to a 2005-2010 average. California’s Sacramento and San Joaquin river basins have lost roughly 15 cubic kilometers (4 cubic miles) of total water per year since 2011 — more water than all 38 million Californians use for domestic and municipal supplies annually. Over half of the water losses are due to groundwater pumping in the Central Valley, according to Famiglietti. 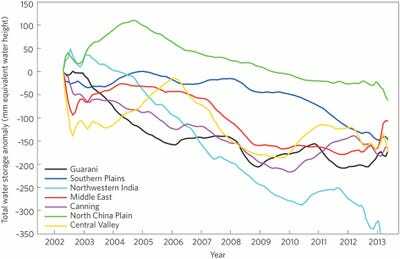 The first step to managing the globe’s groundwater problem is to accept that we have one, Famiglietti recommends. And when societies are ready to look for solutions, the first place they will have to turn is the agricultural sector. Read the full commentary here. You can read news reports about Famiglietti’s article from Mashable, the Financial Times, and Discovery News. Read more about observing groundwater from space in “The Gravity of Groundwater.” Watch Famiglietti give a TEDx talk about groundwater losses below.